Slow computers and what to do about it. Windows computers can and will become slow over time, as a result this will cause loss of time and productivity, not to forget the frustrations. Even though you might have the latest and greatest device with the quickest processor, memory and fast hard disks. the slowness is related how a Windows computer is built using a registry database, temp files.Over time when you’re PC is getting older there will be broken links to old programs and applications. This will pollute your computer over time and cause you to experience a slower PC. Your slow PC will probably first cause frustration and also reduce your productivity. What normally would have taken 15 or 20 minutes all of a sudden will become a 30 or 45 minutes job. As you would know already by the end of the day it’s easy to lose 1 or 2 hours productivity. you could have used your time better, and feel not so frustrated or annoyed and earned more. Over time when you’re PC is getting older there will be broken links to old programs and applications. This will pollute your computer over time and cause you to experience a slower PC.Your slow PC will probably first cause frustration and also reduce your productivity. What normally would have taken 15 or 20 minutes all of a sudden will become a 30 or 45 minutes job. As you would know already by the end of the day it’s easy to lose 1 or 2 hours productivity. you could have used your time better, and feel not so frustrated or annoyed and earned more. Your slow PC will probably first cause frustration and also reduce your productivity. What normally would have taken 15 or 20 minutes all of a sudden will become a 30 or 45 minutes job. As you would know already by the end of the day it’s easy to lose 1 or 2 hours productivity. you could have used your time better, and feel not so frustrated or annoyed and earned more. Luckily it is not the end of the world and there are ways to improve your computer performance without investing in brand new hardware. If you are like many others and have more than one program open at the time, like Outlook, Word Excel a few browser tabs other business-specific programs. That is often not a big deal especially a computer can run multiple programs at the time but you have to be mindful that the programs do not exceed the available memory. For example, your PC has 4 GB memory built in you should avoid consuming all the 4 GB of memory with all open programs. 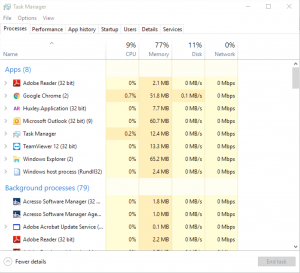 In Windows, you can use the task manager to easily see what application or process is hogging the memory or using all the processors. Start task manager either using CTR-ALT-DEL or right-click the taskbar and select task manager. This will show Applications and processes and you can quickly see which application is using the most memory or CPU. If any application is using too much resources, you might want to close it normally — if you can’t, select it here and click “End Task” to force it to close. 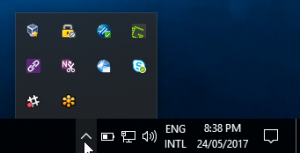 Many programs run in the background and can’t be seen in the normal taskbar. These programs can be found in the system tray or notification area. This is the area on the left of the clock on your screen. Selecting the little up arrow shows all running programs in the background. You can close the programs to free up resources to make your computer run faster. Be mindful not to close the antivirus programs because they will protect you against malicious software. When your computer starts up many applications are automatically loaded during login, this is done to make the programs start quicker once the computer is running. Some of these programs have been installed once but you actually don’t use them and this they can be disabled. 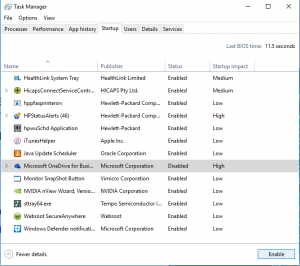 Open the task manager and select the Startup tab, review all the applications which are enabled and select the programs who you don’t use or not need. By simple selecting the program and clidk disable.